Today I present to you the one hundred twenty-second edition of the Highsec Miner Grab Bag. To all the carebears of highsec, one might say: Merry Christmas and Happy New Year! ...But carebears are rarely merry or happy. Even so, in the interest of full disclosure, I must say that after writing the preceding EVEmail, Arca Statum took a day to calm down and sent an apology to Agent Pod-Goo Repoman. Just kidding. Only Gallant miners ever apologize, and Arca is no Gallant. That was a test, dear reader. We'll see a Gallant later on in this post. Djoi Win didn't appreciate getting the chance to provide our Agent with feedback after being ganked. It's said that people are less happy if they have too many choices--but feedback opportunities? Surely those can only be a good thing. Djoi condemned the Agents of the New Order and still had enough hate left over for all the Dutch. Sadly, Djoi would need to wait for another world war (or at least a European conflict of significant scope) to get revenge for his ship and pod. Assuming Lana's memory is correct, she was busy "doing Uni Coursework" at the time of the gank. Listen, carebears. You can either travel through highsec or you can do Uni Coursework, but you can't do both. Not at the same time, anyway. Holystr Charante was convinced that only a "cripple" would attack an AFK player in highsec. But courage, honour, integrity, and elite PvP skill are not disabilities. Regardless, becoming an Agent of the New Order isn't about the body--it's about the heart. No, Apocalypse023 Gamble is solidly in the Goofus camp. This was another test. I do hope you're taking these seriously, dear reader. Aha. There's our Gallant. Enjoy the holiday cheer. I've often said that every little bit counts. Even if you can only afford to buy a small number of New Order shares, you should definitely do it. It always pays off--though sometimes more than others. Race Creire-Geng hit the jackpot when his purchase of 50 shares of New Order stock nudged us just over the 1 trillion 102 billion isk mark. What great timing! Race probably didn't expect to get a Supreme Protector's Tip of the Hat™ from a 50-share purchase, but get one he did. Race hereby receives a Supreme Protector's Tip of the Hat™. You never know, dear reader--it could happen to you. Buy some shares and see for yourself. Or better yet, buy a lot! Previously, on MinerBumping... Self-styled philanthropist Rogue Halo offered to give away 65 billion isk to members of the Market Discussions subforum on EVE-O. The project was received warmly, but it came to an abrupt end when Rogue revealed himself to be none other than the notorious Fin Udan. The warning signs had been there from the beginning. A few days earlier, Rogue had whined about CCP allowing the legendary New Order IPO thread to remain in the forum. Although posters dismissed his complaints, they didn't yet realize with whom they were dealing. Back when Fin Udan set fire to the forums, he'd made many enemies. Apparently he didn't let go of his grudges when he changed names. 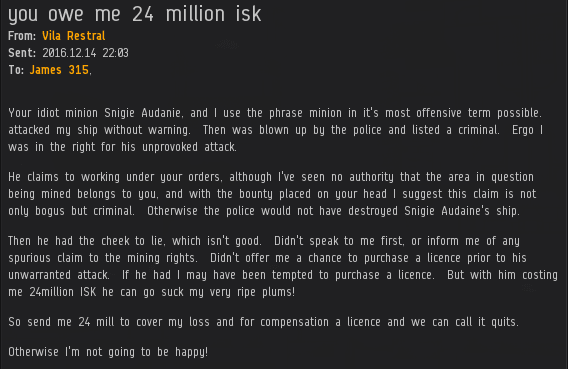 Later, after Rogue announced his true identity in the 65 billion isk giveaway thread, he decided to have a little fun. Those who remembered Fin were appalled to see him return. Fin was greeted by his nemesis, Bumblefck--the same man who had dubbed him "Fun Fin". Fin/Rogue was done with the giveaway thread. He had bigger fish to fry, anyway. 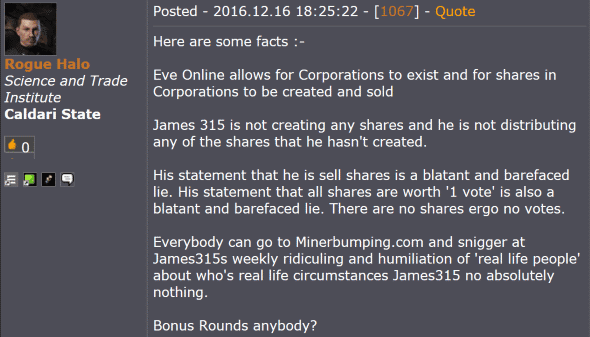 Meanwhile, back in the New Order IPO thread, Bumblefck pressed Fin to admit he wasn't just an impostor. Bumblefck recognized Fin's style, but he wanted confirmation. Considering what Fin had done in the past, it was almost impossible to believe CCP would allow him to come back to the forums. The "Fun Fin" nickname had always bothered Fin in the past. Now he would take ownership of it. He intended to get his revenge on Bumblefck, but there was another, even more important, score he wanted to settle. Fin planned to bring down his greatest enemy: The man whose forum thread had driven Fin to self-destruction all those months ago. Fin pulled a quote from a recent MinerBumping post, Why They Hate the Code, Part 2. The quoted material was from the section about the "Gullible Gull". Hoping to derail the New Order stock program and discourage potential investors, Fin camped out in the IPO thread and waved the quote like a bloody shirt. Fin was certain that he'd found a weapon with which he could finally put a stop to MinerBumping and the New Order. However, the IPO thread was too small a platform. Time to think bigger. Fin left Market Discussions and went to what he knew to be the highest-traffic subforum on the board: EVE General Discussion. He created a thread titled "CCP Associates". It was sure to get plenty of attention. Unfortunately for Fin, the public was unimpressed. Given the obvious context of the quote, they accused him of poor reading comprehension. Critics also wondered why Fin believed CCP was "closely associated" with MinerBumping. It's a good question, but recall that Fin had previously accused the ISD and CCP of being closely linked to (or perhaps bribed by) the New Order; it was the only explanation he could think of for why they allowed the IPO thread to remain open against his wishes. Fin was undeterred by the poor reception of his latest anti-Code attack campaign. He knew that this was his last chance to bring down the New Order and get the IPO thread locked. He was totally committed to his objective. And the Fin was just getting started. 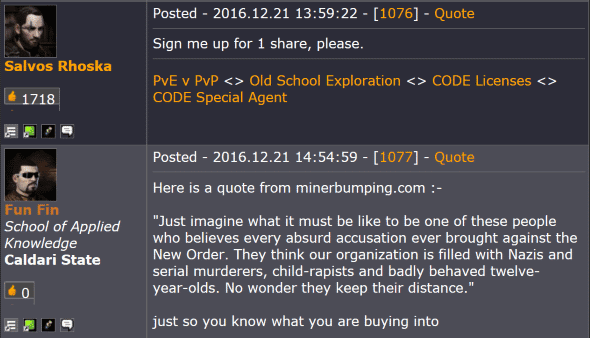 Previously, on MinerBumping... Our readers gained an even more profound understanding of the New Order's enemies and their motives. "CCP must like ganking. That's why the mechanics are in the ganker's favor." Earlier, we saw that the Passionate Young Rebel's flame always dies. For most former Passionate Young Rebels, the only way forward is out: Out of the rebellion, or out of EVE entirely. However, there is still room in the anti-Order resistance for a privileged few. These are the Cynical Old Rebels, who find themselves propelled by the force of inertia alone. The Cynical Old Rebel looks upon each new generation of Passionate Young Rebels with a sense of paternal amusement. He no longer believes in victory against the New Order. In fact, the Cynical Old Rebel has long since come to accept the fact that the Code always wins. He's seen it happen too many times. He knows that the new crop of rebels will fail, but he says nothing to discourage them from their futile endeavors. It's not his place. As for the Cynical Old Rebel himself, he has earned a place of honour among the rebels, by virtue of his seniority if not his victories (since no rebel ever experiences triumph). He may be a moderator of the Anti-Ganking channel or have some other identifying mark of his status. This trinket is what keeps him tied to his old rebel life, rather than biomassing his character. Besides, what else is he going to do? The Cynical Old Rebel clings to a shadow of his former hatred of the Code. He still believes the Code is a bad thing, in general; he may even harbor a personal dislike for our Agents. But he can no longer muster up the energy to make himself really feel anything about it. Having realized the unstoppable power of the New Order, the Cynical Old Rebel looks upon his enemy as a force of nature. It's difficult to properly hate a force of nature. "It's none of your business why I'm here." 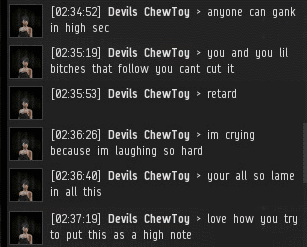 Hatred of the Code in EVE stems primarily from those who would like to continue abusing highsec. Even so, there is a negative attitude toward the New Order even among some residents of lowsec, nullsec, and the wormholes. A portion of that hostility can be traced directly to those who straddle both the highsec and low/null/WH lifestyles. I speak of the Closeted Highsec Dweller, whose main is in the outer regions of the EVE galaxy, but who still prefers to spend time grinding isk in highsec. Of course, most highsec carebears who claim to have a "main" elsewhere are liars. However, it remains true that there are countless players in the outer regions who keep a few alts stashed away in highsec to do their PvE. This has always been the "smoking gun" evidence of the risk/reward imbalance of highsec. Imagine going to all that effort to secure one's place in nullsec against all enemies--only to run missions or mine in highsec! All of our Agents have encountered the Closeted Highsec Dweller. The word "closeted" in the name may be misleading, because some of these highsec characters actually belong to their nullsec alliance. Apparently the carebear values the status symbol more than wardec immunity. Regardless, the Closeted Highsec Dweller represents someone from the outer regions operating illegally in highsec. And he is terminated as swiftly as the carebear who doesn't have powerful friends. New Order diplomacy is simple: Obey the Code. So much for all the shady backroom deals and Machiavellian machinations! The Closeted Highsec Dweller hates being treated like a carebear, but he can't stop acting like one. What makes his anger different from that of a normal carebear is that it is passed along to the low/null/WH alliance to which he belongs, even if he only lives outside highsec part time. If the Closeted Nullsec Dweller can't bring himself to give up the conveniences and luxuries of highsec life, the Nouveau Null is on the opposite end of the spectrum: He can't wait to leave. He's counting down the minutes for his application to a nullsec corp to be accepted. He can't get out of highsec fast enough. And once he does, he plans never to look back. From the beginning of his EVE career, Nouveau Null lived in highsec. Eventually he came to understand the limits of highsec PvE. Yes, it's safer and less complicated and easier to automate. Yes, it's far more convenient, being located so close to the great EVE trade hubs. And yes, you don't have to worry about bubble camps and red pen CTAs and jump fatigue and all that other nonsense. Nouveau Null doesn't care so much about those things. More than anything else, he cares about image. And everybody knows that highsec is lower than nullsec. Nouveau Null dreams of his escape to bigger and better things. He knows his fellow highsec miners often talk about the same thing, but Nouveau Null means it. Sooner or later, he finds a way to make it happen. As soon as he's accepted to a corp outside of highsec, he packs up all his things and moves out. He probably gets ganked on his way and loses his stuff, but that doesn't dampen his excitement. He's graduated! Unfortunately, Nouveau Null still has a cloud over his head, something that he knows will prevent him from enjoying the perfect happiness that he's earned. It's his past, the stink of formerly living in highsec. 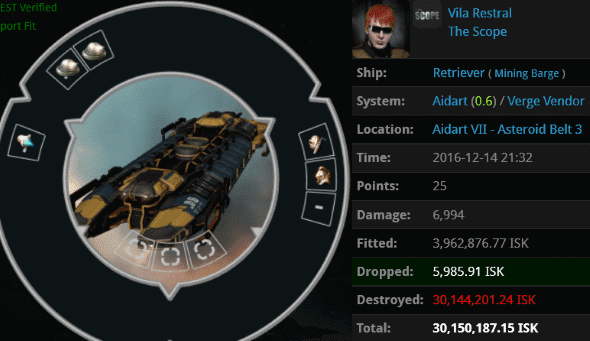 He believes the other members of his nullsec alliance can still smell it on him. 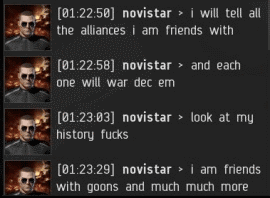 So Nouveau Null does his best to cut all his ties with highsec, to erase every association he may have with his former life. He doesn't have any roots in highsec anymore--how could he? He hates highsec. He hates everything about it. Nothing is more "highsec" than the New Order of Highsec. The Code is highsec in its most ideal form. Nouveau Null must therefore despise and look down upon the New Order. Even if he never sets foot in highsec again, he must be disgusted by it. 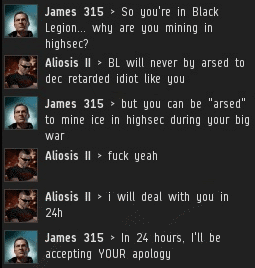 He's better than highsec, now. Ah, the Market Discussions subforum on EVE-O. Normally home to scams and failed businesses, it is also the place where the most successful legitimate enterprise in EVE history was announced. I speak, of course, of the New Order's shares program. More than a trillion isk worth of reimbursements has been paid out, dwarfing all other public programs we've ever seen. (By way of comparison, the famous Hulkageddon Infinity paid out around 50 billion isk.) With nearly a thousand replies and 150,000 views, the New Order thread is the subforum's crown jewel. 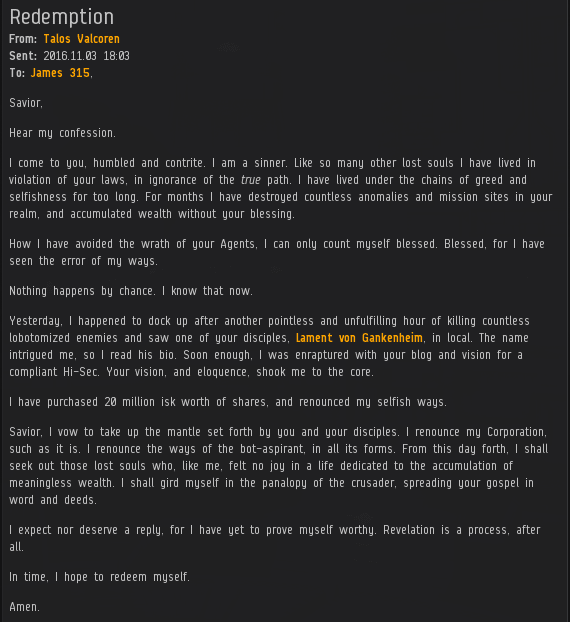 One fine day, a fellow named Rogue Halo started up an exciting thread in which he offered to give away his entire personal fortune of 65 billion isk. Would the post be taken seriously? Serious money calls for serious forum posting, and the enterprising Market Discussions community quickly went to work. Naturally, there were doubters. With a few notable exceptions like the aforementioned New Order shares program, business ventures on EVE-O tend to be scams. However, Rogue Halo wasn't asking people to give him money. Things seemed promising. Encouraged by the subforum's general enthusiasm, Rogue Halo dismissed the skeptics and began giving away some money. Or so he claimed. Fifteen billion isk was distributed--no strings attached. Better still, fifty billion more was promised. Rogue Halo's thread was functioning as a model of aboveboard generosity. It was a Market Discussions sensation, a cause for great celebration and optimism. But in EVE, such a thing is not meant to last. The 65 billion isk giveaway came to a sudden and unexpected end--coinciding with the arrival of an ominous figure. You know his name, even if you can't quite place it yet. Fin Udan. Who is this man? Yes, Fin Udan, the notorious Market Discussions poster who was the subject of the Forum Freakout series back in May. He gained his notoriety by repeatedly and aggressively demanding that the New Order shares thread be closed. He directed profanity at the ISD members who got in his way, and he even accused them of being on the New Order payroll. But Fin was no ordinary forum troll. Despite his continual violations of the EVE-O rules, some of which warranted an immediate permaban, Fin was mysteriously untouched by the forum moderators. At one point, Fin Udan was driven mad by his own sense of invincibility. He threatened to use his unholy powers to destroy the forum. Whatever had been the source of Fin's luck or power, it eventually ran out. 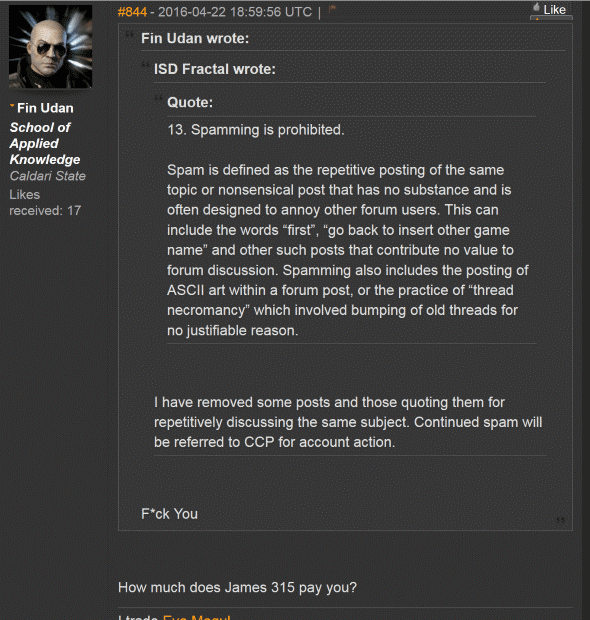 Fin Udan was banned from the forum and biomassed. In a final bout of anger, he promised revenge. And then, quiet. For seven months, nothing more was heard from him--until now. Had Fin Udan truly returned, or was it a pretender using his name? 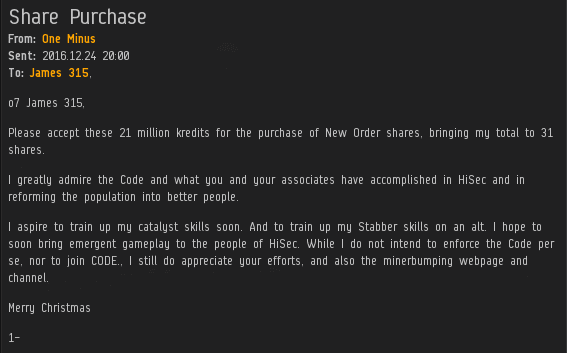 A few days before offering his 65 billion isk giveaway, Rogue Halo posted some replies in the New Order shares thread. The style and substance of his complaints were eerily similar to those of Fin Udan. Rogue Halo and both the old and new Fins were indeed all the same person. And he was about to make good on his promise to get revenge.